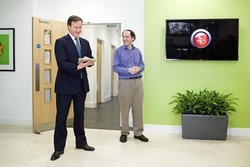 It was great to welcome David Cameron, British Prime Minister, officially to open our new Wolfram Centre in Oxfordshire, UK today. Rather than a traditional plaque unveiling, we went virtual: an iPad button wirelessly firing off a sequence on a nearby TV, the ending "plaque" presenting live data captured at the moment of unveiling--the current weather, FTSE level, star chart and even the PM's age of 16562 days. More seriously, we talked two topics I believe are key Britain's hi-tech role: making government data truly accessible (to citizens and government(!) alike) and resetting maths education to be computer-based--both more conceptual and more practical. It's interesting how much the first chimed with the PM's 2010 TED talk about people empowerment in a "post bureaucratic age". It was fun showing how Wolfram|Alpha queries and interactive CDF could serve this agenda (including through Siri), and how the problem-centred approach of computerbasedmath.org might give the UK an opportunity to leapfrog other countries in STEM. It's clear that the PM is keen to see Britain as a bold new tech and information hub, able to punch above its weight in reshaping the value-chain of knowledge, or what I've described before as the "computational knowledge economy". In our unusual kind of way, I believe we can contribute unique facets to driving this agenda.